1) This peer reviewed paper was presented at FIG Working Week in Abuja, Nigeria, 8 May 2013 and evaluates the accuracy of static GPS surveying through active stations with regard to the official passive control point networks in EUREF-FIN. Over the past decade, active GNSS stations have become increasingly essential for surveying. Positioning services, such as network-RTK, have revolutionized surveying practices and challenged traditional control point networks and the ways of measuring them. A change from a passive to active definition of control point networks would require a comprehensive change in measuring principles. Until now, surveyors making geodetic measurements have been obliged to do the measurements hierarchically relative to the nearest higher order control points. In Finland, the definition of the national ETRS89 realization, EUREF-FIN, is based on traditional passive networks instead of active GNSS stations. 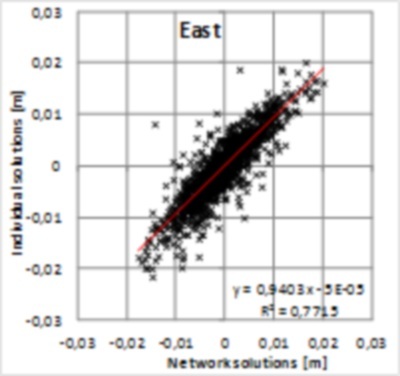 Since the average spacing of active stations in network-RTK services is approximately 70 km, and for passive networks much less, the use of active stations would require measurements neglecting the hierarchy of the (defining) passive networks. In this paper, we evaluate the accuracy of static GPS surveying through active stations with regard to the official passive control point networks in EUREF-FIN. 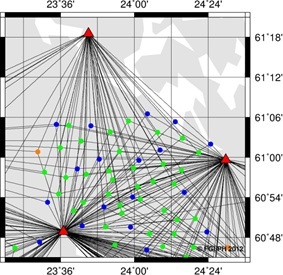 The results of this study allow us to conclude that the consistency of static GPS surveying from active GNSS stations with respect to the official hierarchical passive control point network is in the order of 1–3 cm (rms). However, some systematic features can be seen. One issue that needs more careful consideration is the determination of ETRS89 coordinates for active GNSS networks. In Finland, the reference frames (i.e. positions of control points) are influenced by postglacial rebound that challenges the determination and maintenance of accurate static coordinates, especially in wide areas and over a long time span. This study suggests that the obtained accuracy can be improved by correcting for the postglacial rebound effect. European Terrestrial Reference System (ETRS89) in Finland, the EUREF-FIN reference frame, was realized and is maintained through active (permanent, continuously operating) GNSS stations. The densification part, i.e. access to the frame, is based on traditional passive control points (benchmarks) in the ground. In addition to official control point networks, there are positioning services available that are based on active GNSS networks. However, the definition of EUREF-FIN still relies on passive networks because (dense enough) active networks and their positioning services, i.e. network-RTK, are provided by private companies and, until recently, no binding regulations have been introduced for such services. The change from passive to active networks would require a comprehensive change in measuring principles. Until now, surveyors making geodetic measurements have been obliged to do the measurements hierarchically relative to the nearest higher order control points. 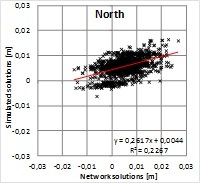 Since the average spacing of active stations in network-RTK services is approximately 70 km, and for passive networks much less, the use of active stations would require measurements neglecting the hierarchy of the passive networks. Also, the connection of active networks to EUREF-FIN bypasses the network hierarchy because they are fixed to the sparse active network FinnRef® and not to passive networks. Even if passive networks still define the reference frames in Finland, greatly increased use of network-RTK services in both real-time and post-processing have changed the situation in practice. Since many users are already using these positioning services, access to the EUREF-FIN reference frame in such cases is through active GNSS stations. Advantages such as smaller investments in GNSS instruments and cost-effective measurements have raised the question of whether the traditional way of measuring is still necessary today. In addition, the need and the future of control points have been questioned by surveyors. In order to provide answers to these questions, this study evaluates the accuracy of static GPS surveying through active stations with regard to official passive control point networks in EUREF-FIN. Given that the purpose of this study is to evaluate positioning accuracy in Finnish ETRS89 realization, EUREF-FIN, the reference points have to be well-established to this reference frame. In Finland, the Finnish Geodetic Institute (FGI) is responsible for creating and maintaining EUREF-FIN and, together with the National Land Survey (NLS), for measuring of control points in it. The first order network (E1), including 12 active FinnRef® GNSS stations and 100 passive control points, was measured in 1996–97 (Ollikainen et al., 1999 and 2000). E1 defines the EUREF-FIN reference frame. The FGI densified this network with 350 passive points in 1998–99, and it is classified as E1b (Ollikainen et al., 2001). 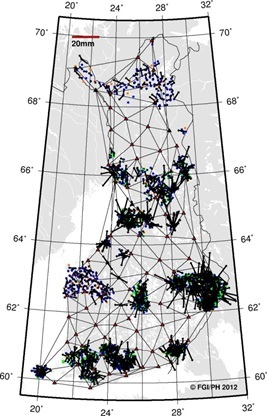 The NLS and the Finnish Maritime Administration have densified these networks with a second order (E2) passive network that consists of approximately 4,800 points (Figure 1). The E1-E2 networks constitute a nationwide backbone of passive control points for EUREF-FIN. In addition to these networks, there are local, municipality-level, backbone networks (E3-E4) and lower order networks (E5-E6) for practical daily use. Currently, there are three separate networks of active (permanent, continuously operating) GPS/GNSS stations in Finland. 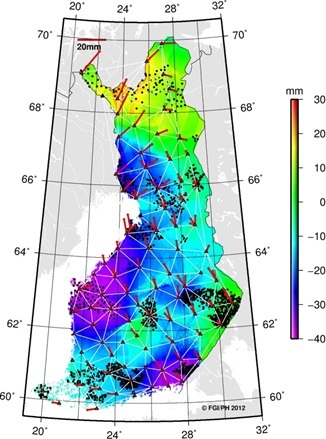 The Finnish permanent GPS network FinnRef® consists of 13 stations and is maintained by the FGI (governmental network). 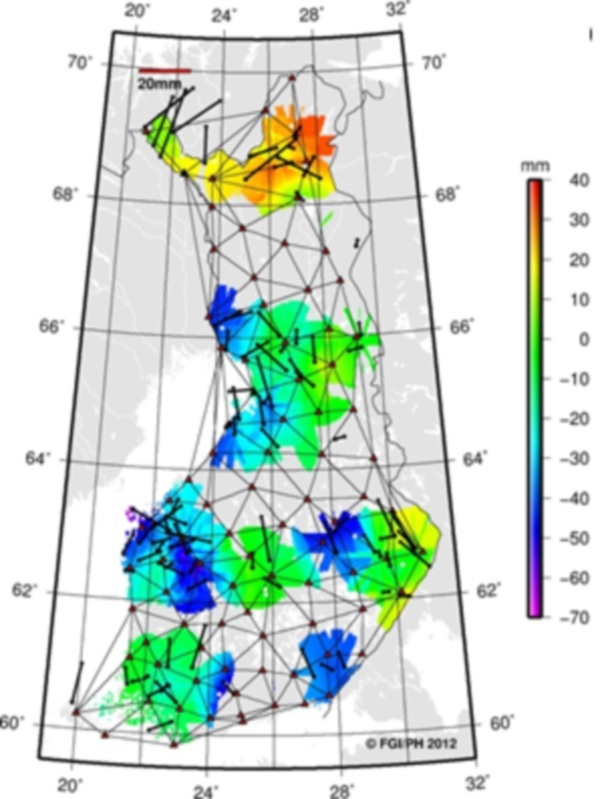 FinnRef is the backbone of the national ETRS89 realization, acting as the link to the international reference frames through one IGS station (Metsähovi), and four stations (Metsähovi, Vaasa, Joensuu and Sodankylä) that belong to the EUREF Permanent Network (EPN). It is also used to connect other (wide area) active GNSS networks to EUREF-FIN. The time series of the FinnRef® stations play an essential role in monitoring the stability of the reference frame, e.g. 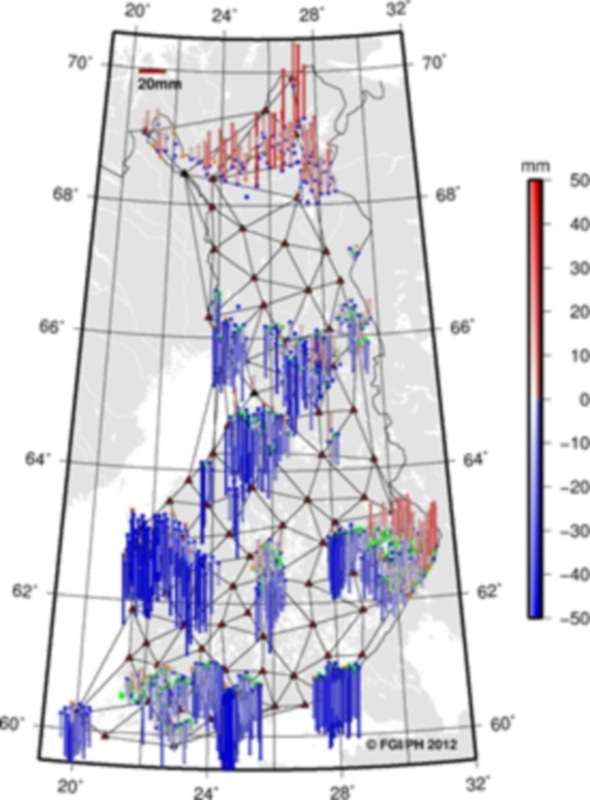 monitoring the effect of postglacial rebound in Fennoscandia. FinnRef® is currently being renewed to be GNSS capable (tracking GPS, GLONASS, Galileo and later also Compass signals) with 19 stations. Most of the old stations will be equipped as dual stations (with a new monument close to the old one) and the rest of the new stations will enhance the geometry of the old network (Koivula et al., 2012). More practical-oriented active networks, such as network-RTK services, are provided by private companies. In Finland, there are two network-RTK services available: Trimble-based VRSnet.fi and Leica-based SmartNet. Geotrim Oy established the VRSnet.fi (formerly GNSSnet.fi and GPSnet.fi) network in 2000. The network became operational in 2002–2003, was expanded nationwide in 2005, was upgraded to GPS+GLONASS in 2006, and later became GNSS capable. The VRSnet.fi network consists of 88 stations (Geotrim, 2012). Leica Geosystems started to build the Leica SmartNet network in Finland in 2011. Currently, the network consists of 58 GNSS stations and, when finished, it will consist of more than 100 stations covering the whole country (Leica, 2012). 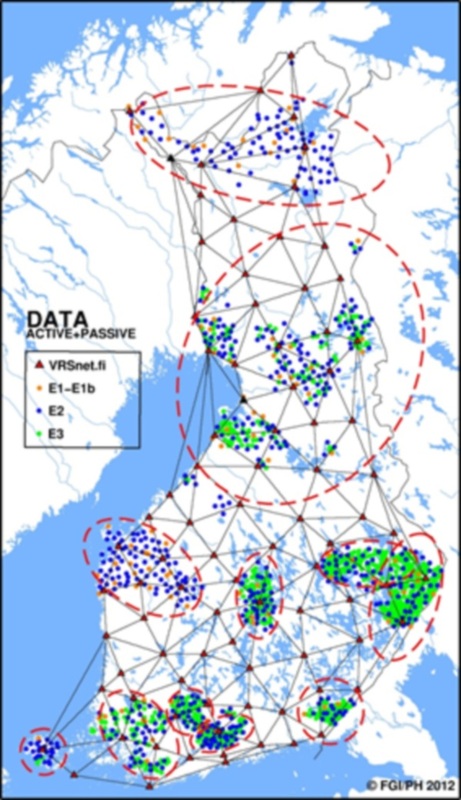 Since the GPS data available for this study were collected in 2006–2010, we used the VRSnet.fi stations to test the consistency between active GNSS stations and official passive ETRS89 control points. The network can be seen in Figure 2. The average spacing of the VRSnet.fi stations is 77 km. Figure 1. Finnish ETRS89 realization, EUREF-FIN, and its nationwide densifications (E1-E2). Figure 2. The VRSnet.fi network and the selected test points for the study. Regional subnets are shown with dotted lines. We have used a set of GPS data collected by the NLS while doing E2-E3 densification measurements in 11 regions (subnets) in 2006–2010 (Figure 2). Exactly the same data were used to determine the reference coordinates of the control points in E2-E3. The data also include observations on fiducial points (E1-E1b points for E2 densifications and E1-E2 points for E3 densifications) since the original densification measurements were made hierarchically with respect to the nearest higher order reference points. 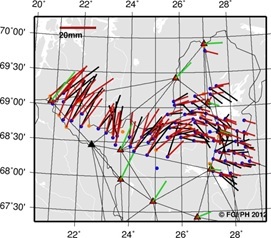 The study consists of about 1,450 passive control points in E1-E3 coordinate classes with an average spacing of 33 km in E1-E1b, 10 km in E2, and 7 km in E3. The GPS data were processed and adjusted by fixing the active GNSS stations of VRSnet.fi instead of passive control points. This method neglects the hierarchy of the control point networks. 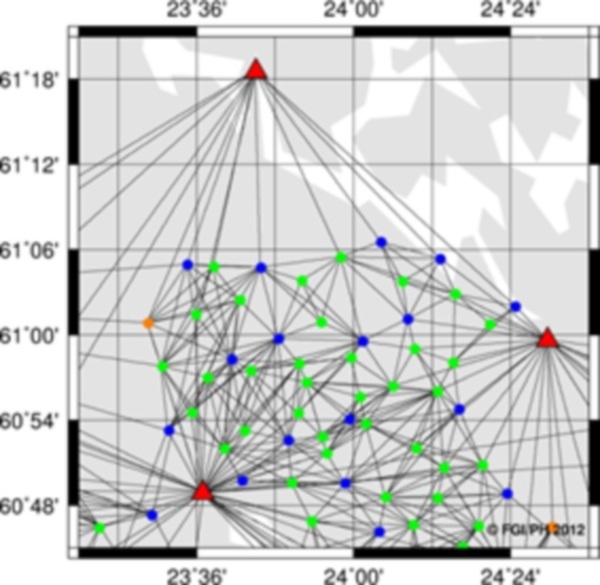 Since the same GPS data were originally used for determining the reference coordinates for E2-E3 points, the residuals of this study show explicitly the accuracy of our alternative, non-hierarchical, method of determining the coordinates for the points. The GPS data were processed and adjusted with Trimble Total Control 2.73 software using double differencing, IGS precise ephemerides, CODE global ionosphere maps (GIM), 10 degree cut-off angle, classical Hopfield troposphere model, and otherwise default processing and adjustment parameters. The data at passive stations were collected and processed with 15-second observation interval, while active stations had 30-second observation interval. In total in all subnets, 9,802 and 7,472 baselines (for the network and individual solutions, respectively, see next paragraph) were processed in the study. The baselines range from 0.4 km to 260.8 km, the average being 17.8 km for the network solutions and 51.3 km for the individual solutions. The minimum occupation time was limited to 30 minutes based on a study by Häkli et al. (2008), while average occupation times were 2.1 and 2.7 hours for network and individual solutions. Only baselines with ambiguities solved/fixed to integers were taken to adjustment. We had two alternative strategies for the computation. In both cases the coordinates of active VRSnet.fi stations were kept fixed. In the first solution, all possible baselines were processed and adjusted together forming closed loop networks in which most of the baselines between adjacent points were solved (network solution). 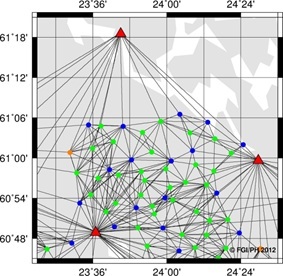 The outmost points of the networks were connected to the nearest active VRSnet.fi stations. In the second solution, the points were processed and adjusted individually connecting each point only to the nearest three to four VRSnet.fi stations (individual solution). This means that inter-point baselines were not solved at all and each point belongs to its own network. An example of the two cases is shown in Figure 3. Figure 3. Alternative computation strategies of the test data. The data were processed as network (left) and individual (right) solutions. 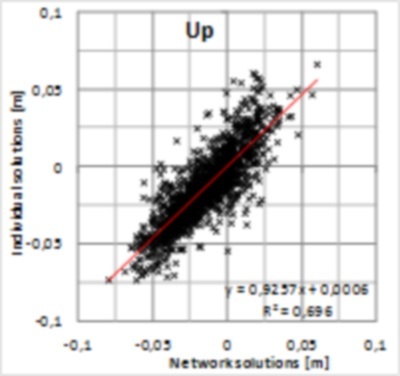 In the network solutions, adjacent points are mostly tied with a baseline in between. In individual solutions, all test points were tied only to the nearest three to four active GNSS stations, leaving the baselines between the test points unprocessed. The two solutions were tested for purposes of practicality and requests from surveyors. The latter solution strategy would require only one GNSS instrument (in the field), while the former solution requires a minimum of two but, in practice, more simultaneously observing instruments (also considering formation of the loops, trivial vectors and redundant baselines for the adjustment). This is mainly a question of cost-effectiveness reducing the required manpower and investments in instruments. In both solutions some baselines and points had to be rejected either after baseline processing or network adjustment. For example, all float vectors were rejected after baseline processing. The main reason for rejecting the baselines was insufficient data (too short occupation time). The test data were originally planned and collected for hierarchical measurements with relatively short baselines, while the baselines to the active stations are much longer. As a result, some baselines with insufficient data exist, especially in individual solutions where baselines were much longer than in the original hierarchical measurements. Normally this should be compensated for with longer occupation times but it was not possible in the case of the available data. In some cases a baseline rejection led to bad network geometry, meaning that a point no longer fulfilled the preset requirement of each point having to be connected with a baseline to at least three other points. These points had to be eliminated before the final adjustment. The number of points after the final GPS adjustments was 1,468 for network solutions and 1,451 for individual solutions. After successful adjustment the coordinates were compared to the official EUREF-FIN coordinates of the points. In this paper, we use the term 'residual' to refer to the difference between the adjusted coordinates and official coordinates. The residuals were first inspected against outliers. Since the study period is five years (2006–2010) there are some changes in instrumentation and reference coordinates in the VRSnet.fi network. Therefore the outlier analysis was done subnet-wise (same subnets as in GPS computation that were observed during a relatively short time period) using three times the standard deviation (3s) as a criterion for outlier detection. In this case only those points that are inconsistent with regard to the data set they belong to are rejected. In the residual analysis 68 and 50 outliers were found for network and individual solutions, respectively. Most of the outliers are related to the same reasons as in rejections in GPS processing and adjustment, i.e. insufficient occupation time for some baseline(s) connected to the rejected point, bad network geometry or a combination of both. The rejected points with bad network geometry were mainly points at the edge of the network, or even outside the VRSnet.fi network at the borders of Finland, and/or connected to other points asymmetrically. Proportionally, most outliers were found in the E1 class (12.2/7.1%), while in E2 and E3 the values are 6.3/3.3% and 2.5/3.1%, respectively (for network/individual solutions). A larger rejection rate in E1 relates to the fact that the reference coordinates of the E1 points were determined earlier (in 1996–1999) using different GPS data than what was used in this study, whereas the reference coordinates of most of the E2 and E3 points were determined with the same data. The observation epoch difference explains the majority of the E1 residuals. This is due to, for example, postglacial rebound occurring in the Fennoscandian area (see more in chapters 4–5). Additionally, the reference coordinates of the E1 points have been determined using different instruments, different occupation times, different setups (e.g. centring and antenna height), different GNSS processing software, measured under different conditions (e.g. solar activity and satellite constellation), etc., that cause some discrepancies. There are fewer rejections in individual solutions but the final number of accepted points in both solutions is almost the same (1400/1401), which means that more points in individual solutions were already rejected during GPS processing and adjustment. After all precautions taken in GPS processing, adjustment and outlier detection, an additional investigation into occupation times was conducted. The baseline lengths were inspected against occupation times and, in most cases, occupation times were sufficient regarding the study by Häkli et al. (2008), and therefore observational accuracy should not play a big role for the coordinate solutions in this study. The residuals are summarized in Table 1 for both solutions after outlier elimination. 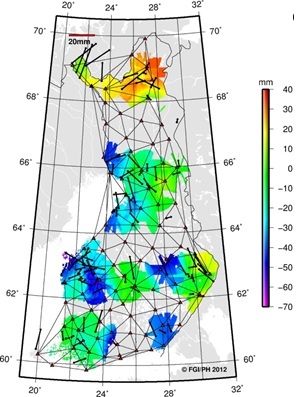 The results show that two thirds of static GPS measurements using active stations in both solution types give roughly an accuracy of 1–3 cm (rms) with respect to the official passive EUREF-FIN control points. These results sound good for practical surveying. However, looking at the spatial distribution of the residuals (Figure 4), it is evident that there are systematic spatial-dependent residual patterns in both network and individual solutions. Additionally, considering 95%- or extreme values, the accuracy may not be enough for all purposes. It is obvious from the figure that residuals are strongly correlated inside the subnets but less correlated countrywide. Standard deviation of the residuals is almost doubled from subnets to countrywide residuals. This and the residual pattern suggest that the VRSnet.fi network and EUREF-FIN are spatially distorted in relation to each other. Additionally, the accuracy of the up component is worse than horizontally by a factor 1:3–4, which is more than typical (1:2–3) and may imply some biases. In the following sections we analyze the possible causes for these findings. Table 1. 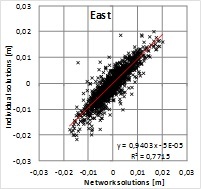 Statistics of network and individual solutions after outlier elimination. Figure 4. 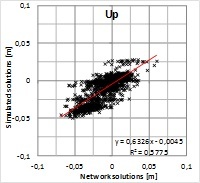 Accuracy of network solutions (top figures) and individual solutions (bottom figures). Horizontal residuals shown on the left and vertical on the right (note the different scale in horizontal and vertical plots). In horizontal plots, E1 residuals are shown with orange colour, E2 with blue and E3 with green. 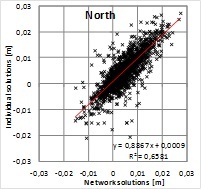 The effect of the measurement/adjustment technique on accuracy was tested by solving the point coordinates as networks and individually from active GNSS stations. The residuals of both solutions look alike (Table 1 and Figure 4), suggesting that the solution type would not have a strong effect on accuracy. To see the solution differences, the solution coordinates were subtracted from each other. Spatially, the horizontal differences between the solutions are negligible in most subnets but in the vertical component many subnets seem to have systematic differences (Figure 5). On the other hand, the mean difference is less than ±1 mm in each residual component, meaning that, as a whole, there are non-existent systematic errors between the solutions (Table 2). The difference in terms of standard deviation, rms or 95% value is roughly half of the respective values for each solution in Table 1. On the whole, both techniques perform more or less equally, showing only a slight advantage to the network solution. However, some spatial differences in performance between the solutions exist. Figure 5. Difference between the solutions (individual minus network solution). Horizontal differences shown on the left and vertical on the right (note different scale in horizontal and vertical plots). Table 2. Difference of alternative solutions, individual minus network solution. Figure 6. Correlation between network and individual solutions for North (left), East (middle) and up (right) components. In order to analyze the significance of solution type for residuals, the solutions are plotted with respect to each other in Figure 6. Pearson’s correlation coefficient shows a strong correlation between the solutions giving r=0.81, 0.88 and 0.83 for North, East and up components, respectively. Squares of correlation coefficients (R2=0.66, 0.77 and 0.70) indicate that roughly 30% of the residuals would originate from differences in the solutions and the rest can be attributed to some common source or sources. This means that majority of the residual pattern cannot be explained with the solution type. Because the alternative solutions were computed with the same GPS data and using the same fixed points, the result indicates that the data and/or the fixed coordinates may include biases contributing to the residuals more than the solution type. Since no clear distinction could be found between the solution types, we took the network solutions for further analysis. Considering the fact that the E1 points have been the reference (fixed) points in the original EUREF-FIN densifications, and also for the GPS measurements at E2-E3 points that are used in this study, the residuals in the E1 points should reveal (at least to some extent and within an observational accuracy) the differences in the VRSnet.fi network and the passive control points that define the EUREF-FIN reference frame. To illustrate the E1 residuals and their possible influence on other points, the E1 and E2-E3 residuals are plotted separately in Figure 7. Looking at the horizontal (black vectors) and vertical (colour map) residuals in the plots, one can instantly see the similarities. This suggests that most of the residuals seen at the E2-E3 points originate from E1 or fiducial (VRSnet.fi) points. This was used to study the influence of biased reference coordinates. Only the network topology from the “from-to” table and the covariance matrices of the vectors are necessary for the normal equation matrix. When forming the normal equation matrix (ATPA)–1 the E1 coordinates were first tightly constrained with the covariance matrix C0. The design matrix A0 includes the identity matrix of size three times the constrained points. The network geometry and covariance matrices of baselines were the same as in the case of the network solution. No actual coordinate difference observations (i.e. measurements) were used because only the normal equation matrix but not the normal equation vector was needed. While in GPS processing and adjustment the coordinates of the active VRSnet.fi stations were kept fixed, here we did the opposite by constraining the coordinates of the passive E1 points and calculated the influence of the bias, xb to the other points including E2-E3 points and the VRSnet.fi stations as well. The bias in the fiducial coordinates was taken from the E1 residuals of this study (adjusted minus the official reference coordinates). Figure 7. Residuals between coordinate classes. E1 residuals shown on the left and E2-E3 on the right. Horizontal residuals shown with black vectors and vertical with color map. The simulated biases can be analyzed twofold: how the residuals at E1 points propagate to lower order points and, if the E1 residuals originate from the VRSnet.fi network, how large the biases would have to be at the active stations. The former can be used to weigh the significance of the simulated biases by comparing them to the residuals of the network solutions at E2-E3 points. The latter indicates the accuracy of VRSnet.fi coordinates in EUREF-FIN reference frame (that is defined by E1 points). A snapshot of the simulated biases (also at the VRSnet.fi stations) together with the residuals is plotted in Figure 8. The simulated biases and residuals look alike, suggesting that the method predicts residuals fairly well. Figure 9 shows the countrywide correlation between the simulations and the network solutions. Considering the correlation, there were three subnets with only one E1 point, meaning that the residual is propagating as such to the other points. These subnets together with the E1 points (at which the correlation is 1) were removed from the correlation analysis. Medium or strong correlation (r=0.48, 0.57 and 0.76) was found for North, East and up components, respectively. Considering the smaller size of the horizontal residuals compared to the vertical residuals, non-existent observation errors in simulations and R-squared values (R2=0.23, 0.32 and 0.58) between simulation and network solution, this result suggests that observation errors dominate the horizontal residuals between E1 and E2-E3 points but a large part of the vertical residuals at E2-E3 points would originate from the E1 residuals. Figure 8. Snapshot of comparison of network and simulated solutions. On the left horizontal and on the right vertical residual (note different scale). Black vectors indicate residuals from the network solution and red or colored vectors are simulated residuals. Simulated residuals for VRSnet.fi stations are shown with green vectors. A black triangle indicates one VRSnet.fi station from where the data were unavailable for the study period. Figure 9. 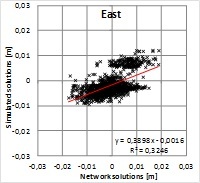 Correlation between network solutions and simulations for North (left), East (middle) and up (right) components. Results from three subnets including only one E1 point were eliminated from the correlation analysis. All E1 points have been removed as well because their residuals were used to propagate simulated residuals for other points in the networks and the correlation for E1 points therefore is equal to 1. Considering the fairly good predictability for E2-E3 points and reflecting this result on the simulated biases at the VRSnet.fi stations, they would suggest that the biases can be considered more significant in the vertical component but less so in the horizontal part. The simulated biases for VRSnet.fi stations are shown in Figure 10 (results from the three subnets with only one E1 station not shown here). Some stations have more than one bias because they have been fiducial stations in more than one subnet. Most of the multiple biases for a station are fairly equal, suggesting good compatibility. 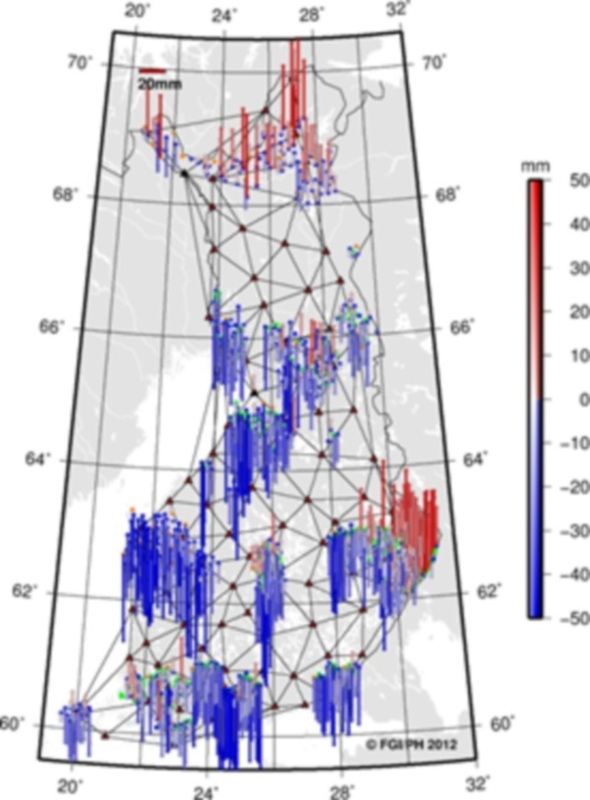 The simulated biases show that the agreement between VRSnet.fi stations and EUREF-FIN is in the order of 5–10 mm in horizontal and 25 mm in vertical coordinates (rms). Figure 10. Simulated biases for the VRSnet.fi stations. The biases can only be considered as indicative. If the station has more than one bias, it has been a fiducial station in more than one subnet. Assuming the simulations are reliable, this could be considered a good result for the horizontal part but some improvements could be made for the vertical coordinates. This discrepancy however, can only be considered as an implication of disagreement due to, for example, extrapolation of the biases, and it can be interpreted as a bias in the reference frame, coordinates of the VRSnet.fi or a combination of both. The most likely reason for the disagreement is the postglacial rebound (PGR) phenomenon occurring in the Fennoscandian area, which is deforming the crust of the Earth (e.g. see papers by Milne et al. (2001) and more recent papers by Lidberg et al. (2007) and (2010)). The PGR mostly influences vertical coordinates (from a couple of millimeters to about one centimeter per year in Finland) but has a small horizontal component as well (up to a few millimeters a year). Considering the effect and that the reference epoch of the EUREF-FIN is 1997.0, it is obvious that the precision of the frame has degraded since its realization. This was also shown in a paper by Häkli and Koivula (2012). However, even if some implications of the reference frame-related issues were found, it is not the subject of this study. A more thorough investigation on the coordinates of the VRSnet.fi network is needed to draw firmer conclusions and to confirm that the residuals are caused by the uplift phenomenon. We have studied the accuracy of static GPS surveying using active GNSS stations with respect to the official hierarchical passive control point networks that, in Finland, define the ETRS89 realization, EUREF-FIN. The study shows that ignoring the coordinate hierarchy results in an accuracy (rms) of approximately 1 cm in horizontal and 2–3 cm in the vertical coordinates. The result is probably enough for most purposes but it includes, however, some systematic features, especially in vertical coordinates, and it could be improved by correcting for the biases. Our analysis implies that a part of the biases would be caused by distortions between the active VRSnet.fi network and the passive EUREF-FIN reference frame. 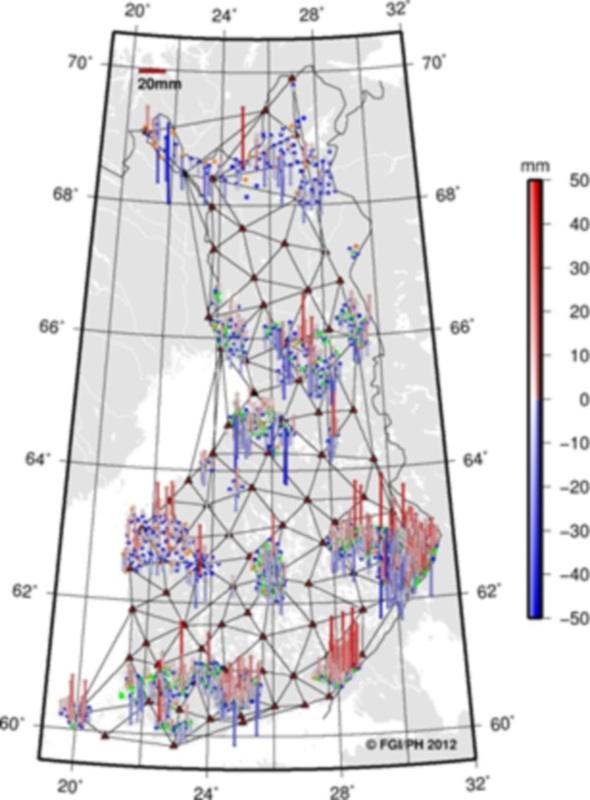 The Earth is constantly changing and the major challenge in maintaining accurate (static) reference frames in Finland is the postglacial rebound that deforms the control point networks. While in the past the traditional measurements were made hierarchically in a smaller area and relative to the nearest control points together with a lower quality, this disagreement did not play a role for several decades from the realization. With current (GNSS) techniques the issue appears sooner, especially for wider areas, due to more homogeneous and improved observation accuracy. Our analysis (still inconclusive on the matter) implies also that postglacial rebound has an influence on the accuracy of this study. Similar results were reported for virtual data generated from the same VRSnet.fi network in Häkli (2006). It is obvious that the determination of ETRS89 coordinates for (wide) active GNSS networks needs more consideration in the future. Currently, there are on-going discussions on how this effect should be dealt with. Some possible solutions are already available, such as the solution introduced by the Nordic Geodetic Commission (NKG) that includes transformation formulae and a model correcting for intraplate deformations caused by postglacial rebound (Nørbech et al. 2008). For Finland, this approach was evaluated in a paper by Häkli and Koivula (2012) that verifies this deformation has to be taken into account in order to reach centimeter level accuracies. Even if some implications of reference frame-related issues were found, it is not a subject for this study and so it was not investigated further. We also studied whether the adjustment strategy has an influence on accuracy. We computed two alternative solutions where, in the first solution, baselines were processed and adjusted as closed loop networks (network solution), while in the other solution each point was connected to only the nearest three or four active GNSS stations without processing the baselines between the points at all (individual solution). The results show that in our study the solution strategy does not play a significant role in the obtained accuracies. However, one must remember that measuring control points individually and fixing them only to active stations may destroy the relative accuracy between the neighboring points. This will probably not be a problem if the spacing between the points is large enough but, for example, considering the accuracies of this study, rms of ±25 mm for the up component means that a relative error between the points can be 50 ppm for a 1 km baseline. Therefore it may still be prudent to measure the baselines between the points if the inter-point distance is small or if good accuracy with high confidence is required. Häkli, P. (2006). Quality of Virtual Data Generated from the GNSS Reference Station Network. Shaping the Change, XXIII FIG Congress, Munich, Germany, October 8–13, 2006. 14pp. Häkli, P. and H. Koivula (2012). Transforming ITRF Coordinates to National ETRS89 Realization in the Presence of Postglacial Rebound: An Evaluation of Nordic Geodynamical Model in Finland. In Kenyon et al. (Eds. ): Geodesy for Planet Earth: Proceedings of the 2009 IAG Symposium, Buenos Aires, Argentina, 31 August – 4 September 2009. International Association of Geodesy Symposia, 136, 2012, DOI: 10.1007/978-3-642-20338-1. Häkli, P., H. Koivula ja J. Puupponen (2008). Assessment of practical 3-D geodetic accuracy for static GPS surveying. Integrating Generations, FIG Working Week 2008, Stockholm, Sweden 14–19 June 2008. 14pp. Koivula, H., J. Kuokkanen, S. Marila, T. Tenhunen, P. Häkli, U. Kallio, S. Nyberg, and M. Poutanen (2012). Finnish Permanent GNSS Network. Proceedings of the 2nd International Conference and Exhibition on Ubiquitous Positioning, Indoor Navigation and Location-Based Service (UPINLBS 2012), 3–4 October 2012, Helsinki, Finland. IEEE Catalog Number: CFP1252K-ART. ISBN: 978-1-4673-1909-6. Lidberg, M., J.M. Johansson, H.-G. Scherneck and J.L. Davis (2007). 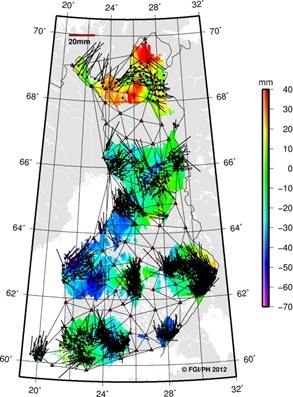 An improved and extended GPS-derived 3D velocity field of the glacial isostatic adjustment (GIA) in Fennoscandia. Journal of Geodesy, 81, 2007, 213–230. DOI 10.1007/s00190-006-0102-4. Lidberg, M., J.M. Johansson, H.-G. Scherneck, and G.A. Milne (2010). 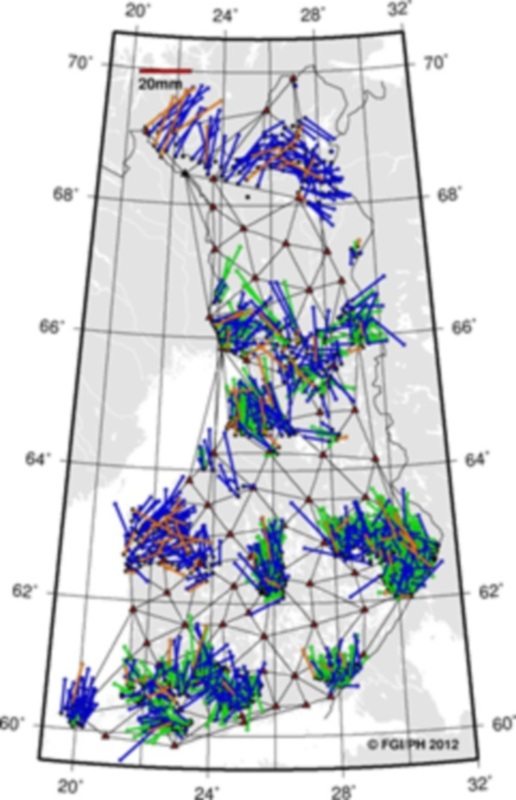 Recent results based on continuous GPS observations of the GIA process in Fennoscandia from BIFROST. Journal of Geodynamics, 50:1, 2010, 8–18. doi:10.1016/j.jog.2009.11.010. Milne, G. A., J. L. Davis, J. X. Mitrovica, H.-G. Scherneck, J. M. Johansson, M. Vermeer, H. Koivula (2001). 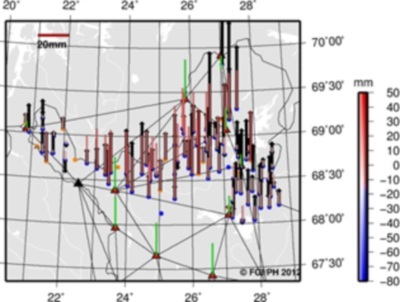 Space-Geodetic Constraints on Glacial Isostatic Adjustments in Fennoscandia. Science 291, 2381–2385. Nørbech, T., K. Engsager, L. Jivall, P. Knudsen, H. Koivula, M. Lidberg, B. Madsen, M. Ollikainen, M. Weber (2008). Transformation from a Common Nordic Reference Frame to ETRS89 in Denmark, Finland, Norway, and Sweden – status report. In Knudsen, P. (Editor): Proceedings of the 15th General Meeting of the Nordic Geodetic Commission, Copenhagen, Denmark, May 29 – June 2, 2006. Technical Report No. 1, National Space Institute, 102–104. ISBN 10 87-92477-00-3. Ollikainen, M., H. Koivula ja M. Poutanen (1999). The Densification of the EUREF Network in Finland. IAG, Section I – Positioning, Commission X – Global and Regional Geodetic Networks, Subcommission for Europe (EUREF). Report on the Symposium of the IAG Subcommission for Europe (EUREF) held in Prague, 2–5 June 1999. Veröffentlichungen der Bayerischen Kommission für die Internationale Erdmessung, Heft 60, 114–122. München. Ollikainen, M., H. Koivula ja M. Poutanen (2000). The Densification of the EUREF Network in Finland. Publications of the Finnish Geodetic Institute N:o 129. Kirkkonummi 2000. ISBN 951-711-236-X. Ollikainen, M., H. Koivula ja M. Poutanen (2001). EUREF-FIN-koordinaatisto ja EUREF-pistetihennykset Suomessa. Geodeettisen laitoksen tiedote 24. ISBN 951-711-243-2. Pasi Häkli and Ulla Kallio are research scientists (M.Sc. Tech.) at the Finnish Geodetic Institute. Jyrki Puupponen is a cartographic engineer (M.Sc. Tech.) at the National Land Survey of Finland.